Material: 84 % polyester / 16 % elasthane. 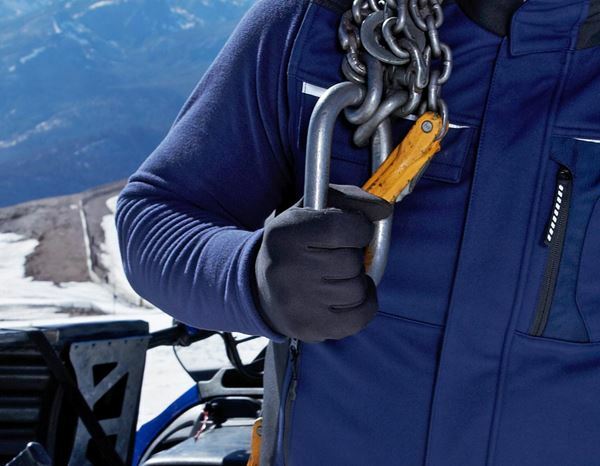 Products from the FIBERtwin® INSOLATION range stand for maximum thermal insulation and outstanding breathability. A unique surface structure and open-pored fibres to store body heat ensure a constant temperature balance: air-conditioning through fresh air from the outside, pleasant warmth from the inside – for an outstanding body climate. Pure warmth combined with freedom of movement! Highly elastic, smooth on the outside and warm on the inside. Thermo stretch functional materials ensure an excellent thermal climate, even when it is very cold outside. Flexible stretch material, breathable and fast-drying – FIBERtwin® thermo stretch offers full functionality and work power! These are gloves specially designed for cold winter days; they satisfy specific work requirements and keep the hands warm thanks to a variety of materials.